Philly Bird Nerd : Big Daddy Owl! This is yet another post about an owl - but NOT a Snowy Owl. 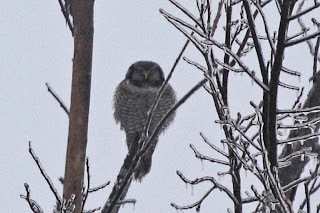 This is a post about an even more obscure and mystical owl - the Northern Hawk Owl. It's THE owl that I have wanted to see ever since I got my first field guide. Back then, there was no Internet. No easy way to know where a bird might have been seen recently. No websites with amazing photos of birds. I used to thumb through that Golden Guide and dream about seeing exotic birds like the Northern Hawk Owl and think - "there is no way that I'll ever see this bird". The bird lives in northern Canada and does not migrate like some other birds. How would I ever be able to get to northern Canada to see one? 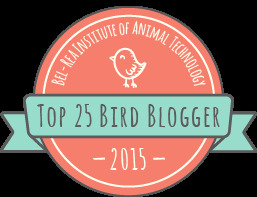 Good news - Al Gore invented the Internet and people actually use it to post bird sightings. 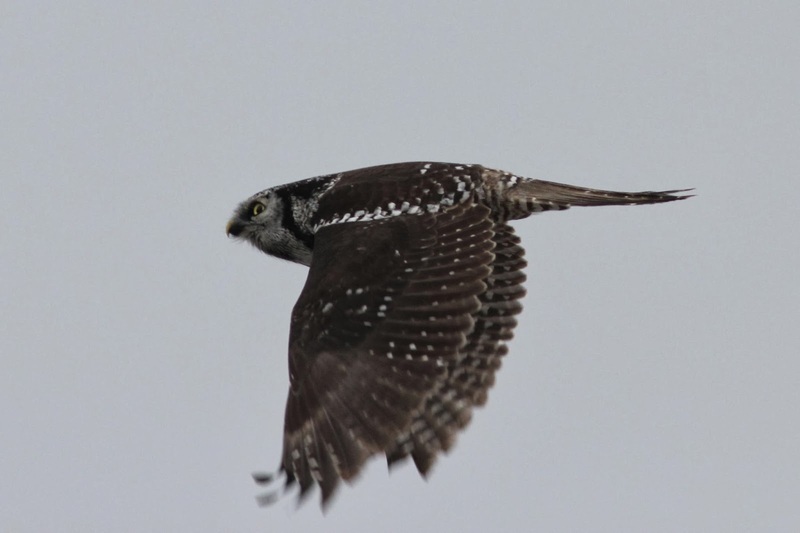 More good news -people reported a Northern Hawk Owl in Vermont! I know what you are thinking - Vermont is really far from Philly. You already know what happened - I went to Vermont. What you don't know is that 4 other crazy birders went with me AND the trip wasn't even my idea AND I didn't drive! HA. The plan was set. I would meet the gang at the George Washington Bridge on Sunday at 6 AM. I was out the door at 4:15 AM, at the GW by 6 and in Vermont with the gang by 11 AM. The gang consisted of Marc, Brandon, Debi and Alyssa - mostly new friends that I have met during the Big Year. Our friend Larry went up to Vermont on Saturday and gave us tips on exactly where to see the bird. He sent us photos that he took of the bird on Saturday. The weather didn't quite cooperate for us on Sunday. The temperature was 65 degrees when I left the house in Philly but is was raining too. By the time we got to the highway in Vermont, the temperature had dropped and the rain was freezing on the roads. Poor Brandon could barely see the road through the thick fog. I thought we were doomed but he did a great job driving. The owl was being reported along Rt 100 in Waterbury Center VT - a pretty busy road. When we arrived at 11 AM, another bird photographer was walking along the road carrying his ginormous camera back to his car. We asked about the owl. He told us that it caught a mouse and flew up over the hill with it. Damn! The hill was part of a big farm field that had trees along the back edge which we couldn't see from the road. The guy told us to hang around because the owl would eventually return to the dead tree which was right next to the road and then he left. We walked up the road and stood by the tree being sprayed by dirty, salty road goo. We stood there for awhile. No owl. Brandon couldn't take it anymore and decided to go across the street and hike up the hill to see if he could see the owl. Never mind the big yellow "No Trespassing" signs. He could see the owl sitting in a tree at the back of the field! So close but yet so far. We were in a dilemma. We didn't want to ignore the No Trespassing signs but we definitely wanted to see the bird that we drove 7 hours to see. Thankfully, Alyssa had an idea - she was gong to knock on the door of the house and ask for permission to stand in the field. Off she went. She reappeared about 10 minutes later along with the homeowners waving for us all to come into the field. She's my Big Daddy! The rest of us ran up the hill to join her. And there it was - the Northern Hawk Owl. Can you see it? First, find the people, then look at the trees. The owl is not in those trees. The owl is in the one of the trees way back in the fog. That is where we had to hike to see the bird. I wore sneakers since it was supposed to be 65 degrees and I was told that the owl was right along the road. Big mistake. By the time we got close enough to actually see the owl, my feet were soaked. Everyone else who saw the bird stood on the road and got GREAT photos. Like this one that Larry gave me permission to use. 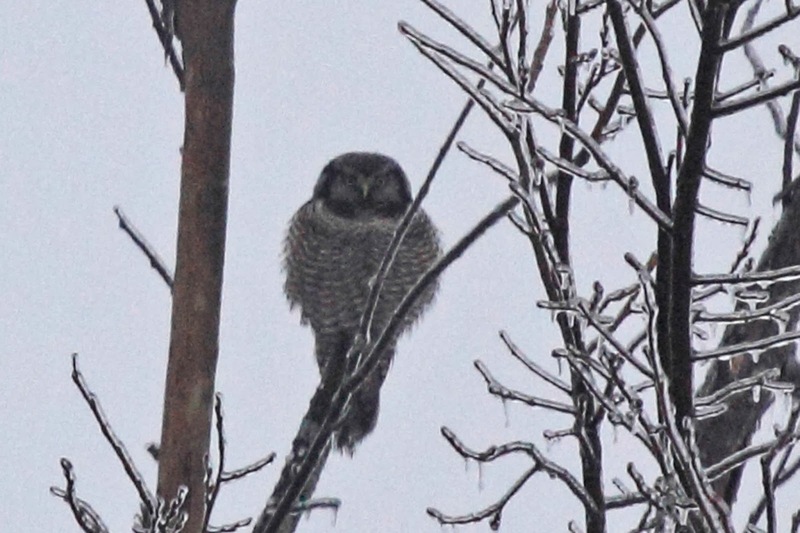 Our photos are terrible but keep in mind - we saw a Northern Hawk Owl! I still can't believe it. The next photo was taken by Alyssa with an iPhone through Brandon's scope and processed through Photoshop. Not bad! This photo was taken by me. It is severely cropped so that you can see the owl since we did't want to get too close to the tree and spook the owl. Check out the ice on the branches - we drove and walked through that mess. The homeowners didn't join us on our hike across the field since they already had a week's worth of up close views of the owl. 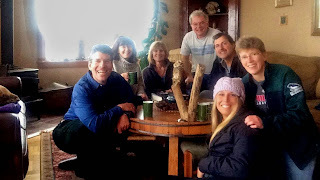 Although they didn't join us, they did invite us to stop in on the way back for some hot tea and cupcakes. How nice was that? "Sure - tramp all through our fields and then we'll make you hot tea and cupcakes". Can you imagine that? Wait til you read the next part - they are owl lovers. They had owl knickknacks all over the house. What are the odds that a rare owl would choose their field to spend the winter? Anyway, many thanks to Ron and Nancy for inviting us into their home. I can only hope that we have the opportunity to return the hospitality someday. We couldn't resist taking a few parting shots on our way back to the car. Of course, the homeowner sent an email at 3 PM telling us that the owl was back along the road. Sigh. We were already too far away to turn around. I arrived back home just before midnight. It was a long day but one that we will not forget. Northern Hawk Owl!!!! ya! What an amazing day. Glad I could be big daddy for the day!